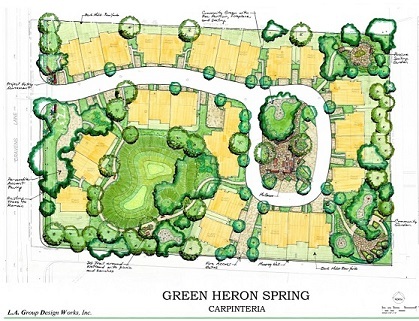 The 30-unit Green Heron Spring condominium project proposes to dismantle an existing residence, barn and storage shed, remodel one residence, and construct 30 new residential units. Four of these will be affordable units. A mix of flats, townhomes and single family detached homes are proposed, comprised of one four-bedroom unit, 19 three-bedroom units and 10 two-bedroom units. 15 structures totaling 69,929 square feet of floor area are proposed. The project is currently in the process of being re-entitled. 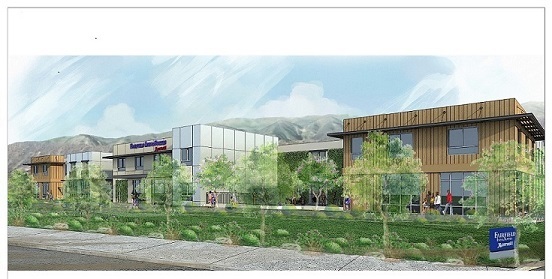 The Lagunitas project is an 85,000 square foot office building development that was approved in 2012. The City's Architectural Review Board is working with the new project owners to come up with a revised concept for the development. The the idea of breaking up the project into 4 or 5 smaller structures and creating a campus-like setting is being explored. This mixed use project is approved for a 6,488 square foot building to be located at the corner of Carpinteria Avenue and Holly Avenue. The ground floor commercial space (approximately 3,000 square feet) will be home to Renaud’s Patisserie & Bistro. The second floor will be the new home of M3’s corporate offices as well as two one-bedroom units. The project is currently in review with the Building & Safety Division and is anticipated to begin construction later this year. The proposed 102-room hotel project site is located on Via Real between Santa Monica Road and Cravens Lane. The hotel would be approximately 48,594 square feet in total building size and two stories in height. The hotel is proposed to be operated as Fairfield Inn and Suites by Marriott. The Architectural Review Board recommended the project for preliminary approval in March 2017. The next step for the project is to complete the environmental review process.